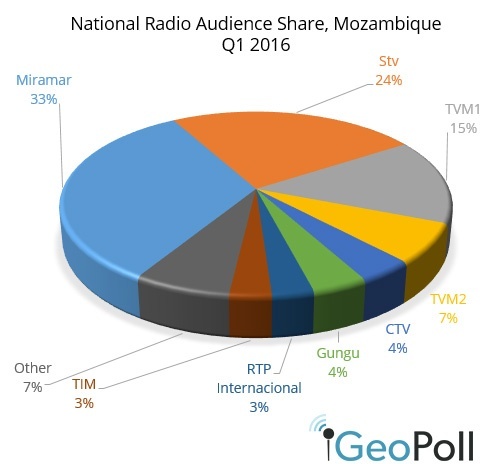 As part of Kantar-GeoPoll Media Measurement‘s daily surveys on audience habits for TV, radio, and print, GeoPoll is pleased to release this report on top TV and radio stations in the Democratic Republic of Congo for Q1, 2016. To learn more about KGMM, see a demo of the system, and sign up for an account please contact us. Radio is a popular media in the DRC, which results in high ratings for the most popular stations. Radio Okapi, a large network which provides news and information in French and the four national languages of the DRC, leads in the ratings with an average rating of 9.8 and share of 35% in Q1 2016, down slightly from a rating of 10.2 and share of 36% in Q4 2015. Radio-Television Nationale Congolaise (RTNC) is the second most popular station, with a rating of 5.2 and average audience share of 19% in Q1, which is up from 3.3 and 12% share in Q4 2015. Radio France International ranks number three, with an average rating 0f 4.3 and audience share of 13% in Q1 2016. To get a complete breakdown of DRC media data, including ratings by region, day-by-day data in 30 minute time blocks for TV and 2 hours for radio, and filtering by demographics and psychographics, please click below to subscribe or see a demo of Kantar GeoPoll Media Measurement.